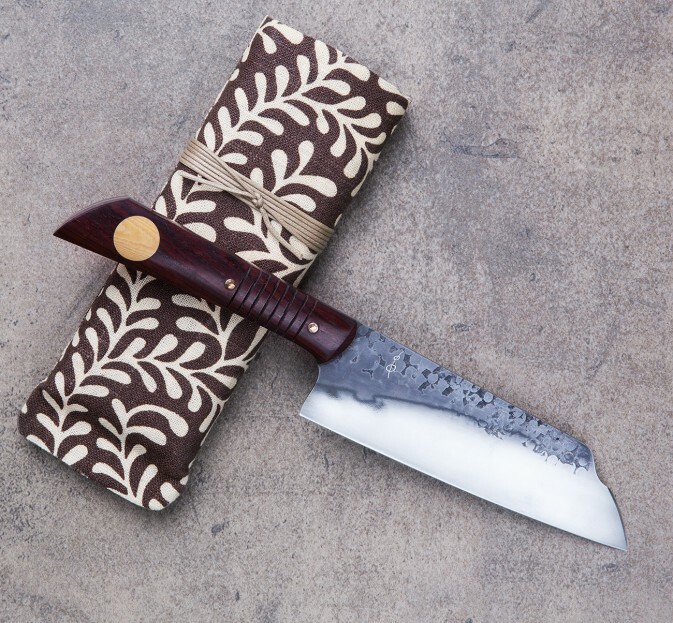 This stout blade, forged to shape from 1095 carbon tool steel and finished with contrasting forge-finished texture alongside etched and polished surfaces, takes the ever-versatile santoku for a ride down a path we very much enjoy. 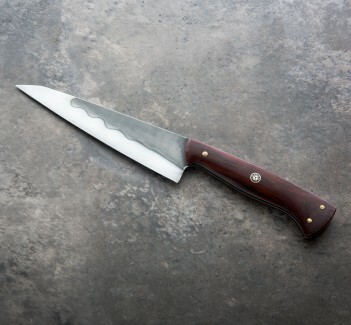 Weighing 6.9 oz (196 g) with 155mm (6.1") of edge this knife is heavier than similar knives of this length due to the absence of a prominent distal taper. 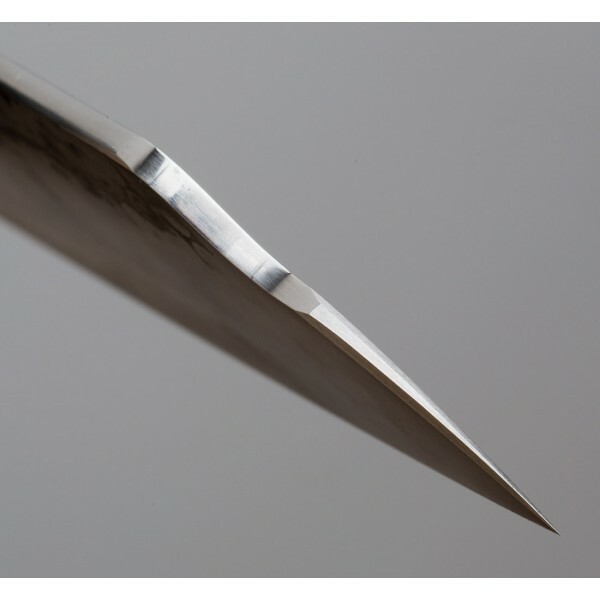 Yet beneath the wide spine is a superbly thin edge (take a look at those photos) that balances right at the front of the handle, making this an excellent tool for so many cutting tasks. 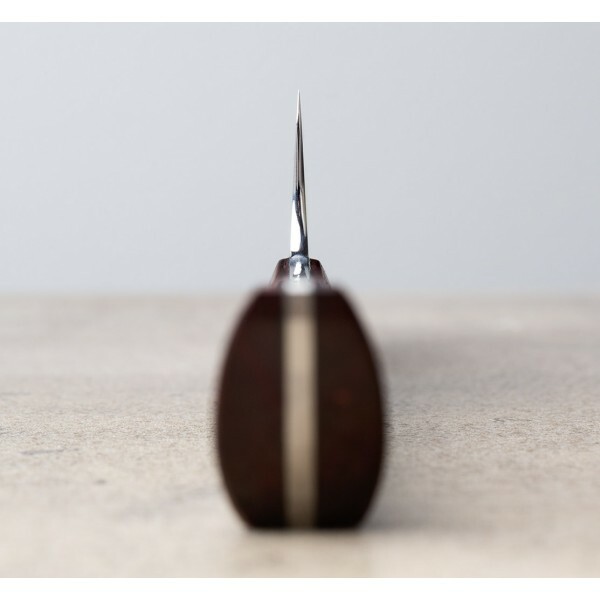 Old-growth cocobolo is used for the handle, with an antique micarta inlay and peened brass pins. A cloth-covered storage case is included. 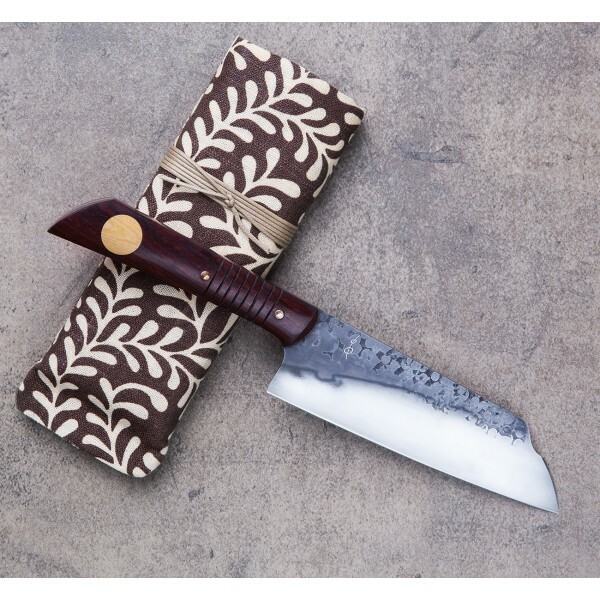 Hand crafted in Los Osos, California, this Step Santoku, like all of Don Andrade's world-class kitchen knives, is uniquely his in design and built with daily use in mind. The attention to detail and materials truly make it an heirloom quality tool. 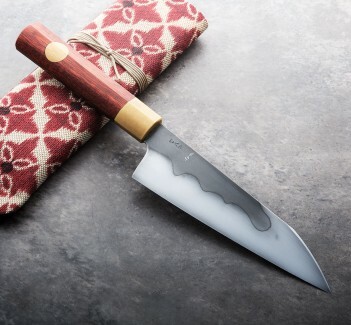 Don's background in fine dining, stone and bronze sculpting, and now blacksmithing, often coalesce in a tool that does more for its user than simply cut, slice, dice and chop. It inspires and brings joy to the cooking process. This is one of those knives. 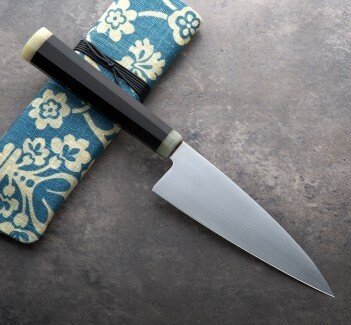 Blade length: 155mm (6.1"). Weight: 6.9 oz (196 g).  1095 carbon tools steel blade. Old-growth cocobolo wood handle, antique micarta inlay, peened brass pins.